Some time ago our kettle started leaking. Every time it was taken from the base the base was covered in water - and it dripped (excessively) every time water was poured. Time for a new one. The old kettle had a built in water filter, but as nobody ever changed the filter we didn't see the need to get another that did the same. My top priority was an eco-friendly kettle. One that used less power. Then we found this amazing appliance. 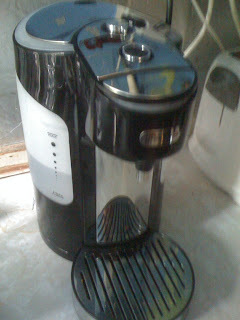 This is the Breville Hot Cup with Variable Dispenser. I'm not quite sure how the mechanics work - but it what it does, in essence, it boil (very quickly) just enough water for your cup (large mug) of tea/coffee. You place the cup on the drip tray and - hey presto - boiling water. And it looks pretty good in the kitchen too!